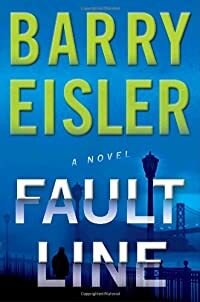 Fault Line by Barry Eisler, a Mysterious Review. Review: Barry Eisler departs from his John Rain mysteries to craft a fast-paced, high-tech thriller set in the heart of Silicon Valley in Fault Line, his first non-series novel. Alex Treven is an ambitious attorney looking to make partner at his firm. He sees his chance when a young inventor who has developed a new, revolutionary data encryption algorithm hires him to file all the necessary patent applications and associated paperwork. But when the inventor and his contact at the patent office are murdered within hours of each other, and he's threatened himself, Alex realizes something is seriously wrong. He knows of only one person to call, his estranged brother Ben. Ben, a covert ops agent for a secret agency within the US government, reluctantly agrees to help but doesn't know exactly what he's in for until someone tries to take him out. And he takes that personally, very personally. Despite four murders committed within the first chapter or two, Fault Line starts fairly slowly for a thriller. The three principal characters (Alex, Ben, and an associate of Alex's, Sarah) are introduced separately but their stories are unremarkable. It isn't until they are together that the plot picks up speed … and interest. Together they're battling an unknown force determined to acquire the encryption software, but individually there are also interpersonal conflicts: between Alex and Ben over the accidental death of their sister when they were teenagers; Alex's unexpressed affection for Sarah, which is unreciprocated; and Ben's suspicion that Sarah may be an embedded agent because of her Iranian heritage and Sarah's resentment that he believes that. Eisler handles these various subplots well while keeping the main plot moving forward, but there's really just a little too much going on here. It isn't clear if Fault Line is intended to be a stand-alone novel or not but Ben, as the most dynamic and arguably most interesting character in the book, could readily sustain a series on his own. To be sure, the book appears to be written with a future screenplay in mind, with a simple plot that's easy for the audience to follow, lots of action, political intrigue with a high-tech slant, the obligatory romantic interlude, an inevitable twist, and so on. The ending is a little too pat (then again, most movies need to quickly wrap up loose threads as well), but overall, Fault Line is a thriller that successfully accomplishes its primary goal of entertaining the reader. Acknowledgment: Pump Up Your Book Promotion provided a copy of Fault Line for this review.